Jimmy James: "Hearing Is Believing"
It’s safe to say Jimmy James boasts one of the more colorful careers ever launched in San Antonio. 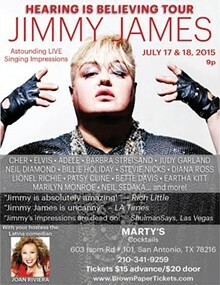 Born James Jude Johnson in Laredo in an undisclosed year (he’s “older than Britney but younger than Madonna”), he started impersonating Marilyn Monroe on a whim in the early 1980s and perfected the act flawlessly enough to land in an Atlantic City revue that led to talk show appearances (from Donahue to Geraldo), performances at high-profile events (for the likes of Whoopi Goldberg, Joan Rivers and Elton John) and national advertising campaigns (including L.A. Eyeworks and Kenar). 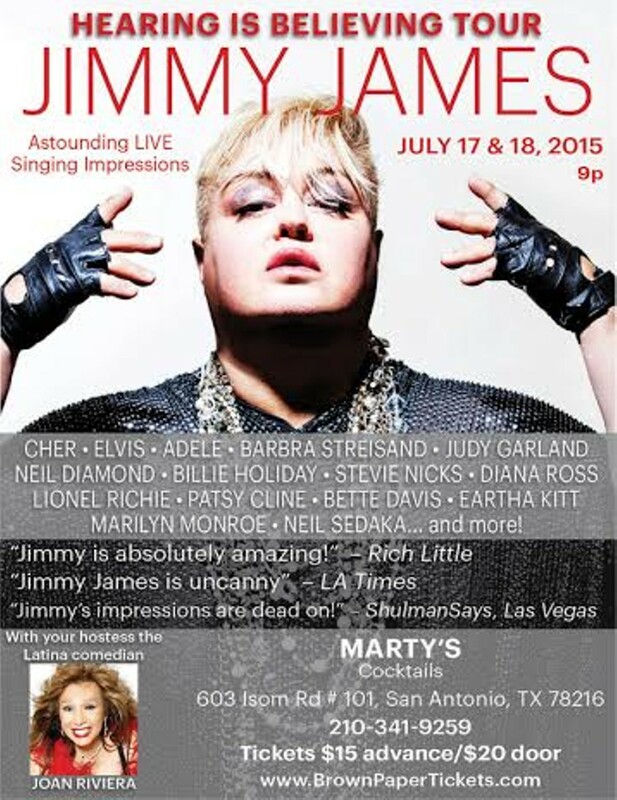 Although possibly known better by younger audiences for his original club hit “Fashionista,” James is a wildly talented vocal impressionist who shifts effortlessly between such iconic voices as Cher, Elvis, Barbra Streisand, Judy Garland and Eartha Kitt. The Los Angeles-based entertainer returns to SA for “Hearing Is Believing,” a two-night homecoming engagement combining impressions, original songs and star-studded anecdotes within the unassuming confines of Marty’s Cocktails.